Do you have skin tags that you would like removed? 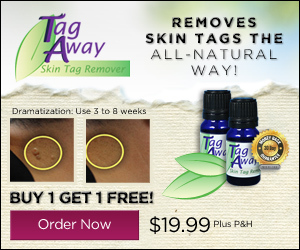 Tag Away is a topical skin tag remover. Use tag away and watch as the skin tags dry up and fall off over the next few weeks. Save money and use this skin tag removal system in the comfort of your own home. Some great benefits of tag away is that it is an all natural product, should not cause scarring, not painful and can be used on all skin types. oil recognized for its tag-removing properties.